The German Government has been supporting the EU approximation process of South-East European (SEE) countries in the energy sector through the GIZ Open Regional Fund for South-East Europe – Energy Efficiency (ORF-EE) since 2008. The ORF-EE has actively been contributing to sector reforms in Albania, Bosnia and Herzegovina, Montenegro, Kosovo, Macedonia (FYR) and Serbia. Croatia acts as a model country within ORF-EE, considering that it has undergone extensive sector reforms as part of its EU integration process. 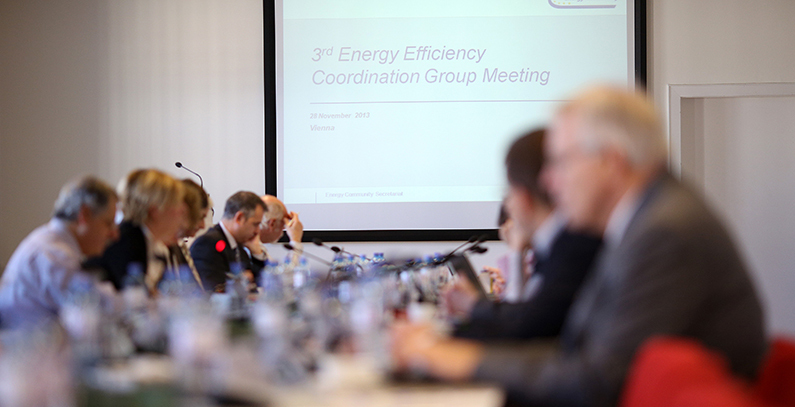 The ORF-EE promotes cooperation among stakeholders with the capacity to drive the process of reform in the energy and climate sector in South-East Europe. Its efforts are directed at building partners’ capacities and providing a regional platform for exchange of experiences and best practices through regional networks. It provides support to energy and climate relevant political and civil society actors through regional SEE partner networks in implementing required EU regulations and sector reforms, and helps spur development of the region. It empowers partners to address sector relevant issues and find mutual solutions. In doing so they directly contribute towards a more effective implementation of necessary measures in their respective countries. ORF-EE provided support to SEE partner countries is in line with the EU Energy Strategy 2030, the UN Sustainable Development Goals (SDGs) and the countries’ responsibilities as signatories of the Paris Agreement. Over the past ten years the ORF-EE has successfully implemented a great number of projects in the SEE region. Among others, it helped establish the Network of Energy-Efficient Capital Cities in SEE. It also supported partner cities from the region in joining the European Covenant of Mayors initiative, helping them establish energy management structures and develop Sustainable Energy Action Plans. In collaboration with the Network of Schools of Political Studies in SEE and through the Public Dialogue Initiative on Sustainable Use of Energy in SEE, the ORF-EE helped strengthen the political will for reform processes in the energy sector of partner countries. As a result, public hearings of parliamentary committees, responsible for energy efficiency, were held for the first time in these countries. The Fund also supported the development of National Energy Efficiency Action Plans and their implementation monitoring process. These are mandatory across the EU. Monitoring was further strengthened by a specifically developed monitoring system and a complementary software program – the Monitoring and Verification Platform (MVP), which is used for calculating energy savings and CO2 reductions. The system was developed as part of an earlier phase of the ORF-EE and was transferred to SEE partner countries for use. Furthermore, the ORF-EE implemented (under EU’s Horizon 2020 Program) the multEEproject that supported the improvement of the consistency and quality of energy efficiency (EE) planning and implementation in several SEE and EU countries, by introducing innovative monitoring and verification schemes. This was done through enhancement of the MVP online based system, adjusting it to fit the specific needs of different countries. The multEE project was implemented by ORF-EE in collaboration with a consortium of ten specialist partners from EU and non-EU countries. Another component of the Fund focused on provision of support to municipal associations of partner countries in strengthening their capacities to adequately represent the interests of their clients – the municipalities and therefore the interests of the citizens. This component was co-financed by the German Federal Ministry for Economic Cooperation and Development (BMZ) and the Government of Switzerland. It was implemented jointly by ORF-EE and GIZ ORF- Modernization of Municipal Services (ORF-MMS). In collaboration with the Energy Community Secretariat and the Višegrad Fund, the ORF-EE is co-funding and co-organizing the EnC Summer School since 2016. Although only a few years in the making, the program has already become one of the most sought after summer school programs in the SEE region, and to an extent, even Europe as such. 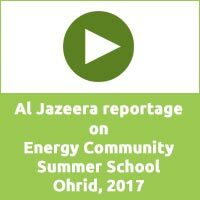 Another success story the ORF-EE has been involved in for many years, is the Regional Summer School on Sustainable Development and Low Emission Planning, which has been organized in 2017 for the thirteenth year in a row in Fojnica, Bosnia and Herzegovina. It is implemented by the Regional Education and Information Centre (REIC) in cooperation with the ORF-EE, and the GIZ projects Promotion of Renewable Energy Sources in Bosnia and Herzegovina (BiH) and Promotion of Energy Efficiency in BiH. This summer school concept has successfully served as a basis for another regional summer school, organized in Kosovo for several years now. The Energy Community (EnC) is another important partner of the Fund. It brings together representatives of national ministries of SEE Contracting Parties to the EnC, responsible for energy and climate. Supported by the ORF-EE, representatives meet regularly in form of the Parliamentary Plenum, the Energy Efficiency Coordination Group, the Energy and Climate Committee and the Environmental Task-Force, working together to advance energy and climate sector reforms in the region. In addition, in the wake of the reform process of the Energy Community, and acknowledging positive experiences of the ORF-EE in working with the NGO sector in SEE, the EnC Council of Ministers decided to intensify its cooperation with NGOs. This contributes to promoting more transparent and participative decision-making in the region. The Fund coordinates its activities with other GIZ projects, as well as with bilateral and multilateral donors and financial institutions to prevent overlapping and duplication of sector relevant activities, and to enable synergistic efforts. This is attested by its active partaking in local donor meetings, as well as in the recently organized Donor Meeting in the Energy Community. 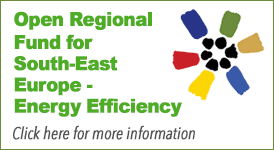 The project’s aim are well coordinated sustainable results in South-East Europe. 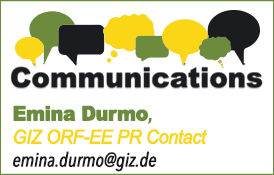 GIZ ORF-EE focuses on building on the potentials arising from the similarities South-East European countries have in common; culturally, structurally, and development challenges wise, which offers great potential for building and sharing relevant expertise in and through regional networks. While relying on its original approach, which is rooted in sector relevant regional exchange through networks, provision of capacity building, advisory and mentoring services – largely focusing on policy development, more recently, the ORF-EE is extending its development efforts in SEE. It has integrated a more comprehensive climate protection approach in its work, in line with the EU Energy Strategy 2030 and the UN Sustainable Development Goals, in particular Goal 11 (Sustainable Cities and Communities) and Goal 13 (Climate Action). In collaboration with SEE capital cities and cities, including municipal associations, the Fund focuses on sustainable urban mobility solutions. Efforts, among many, include provision of support in development of Sustainable Urban Mobility Plans, Roadmaps, implementation of urban transportation Smart-Models (e.g. 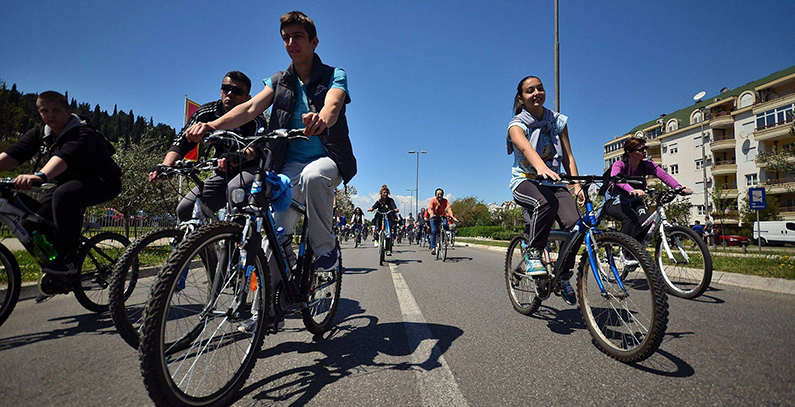 bike and car sharing), P2P knowledge transfer, as well as subject focused mentoring, advisory and coaching services. Further activities include strengthening of capacities of parliamentarians in SEE partner countries in effectively shaping policy-making processes in the field of urban mobility. This is among others, done through an intensified use of regional networks for experience and best practice exchange among SEE parliamentarians and with German parliamentarians on the implementation of climate change relevant EU regulations in the area of urban mobility. Important accent is also placed on the development of a sector focused communication strategy dedicated especially to public awareness raising in the region. As part of ORF-EE’s new project approach, upgrade of the MVP system is foreseen in collaboration with partners, as well as provision of the same for use to local governments in the region – municipalities. The Energy Community Secretariat recommends the MVP system as the official tool for sector relevant reporting. The upgrade of the MVPis done in response to specific requirements under the EE Directive 2012/27/EU and should secure an extended pool of viable data for further analysis, which will help a more comprehensive development of sector relevant strategic documents in SEE countries. It will also enable governments to more closely monitor the implementation of several articles under the EE Directive. The overall goal is to establish a bottom-up direct data exchange between municipalities and national level institutions responsible for EE and climate, complementing the existing structure while improving the data flow, and therefore helping secure more effective policy planning and development. The approach, furthermore, foresees development of a procedure for revision of past and design of new EE measures, which will be based on environmental and economic criteria. It will be created in cooperation with partners – members of theEnC Energy Efficiency Coordination Group. 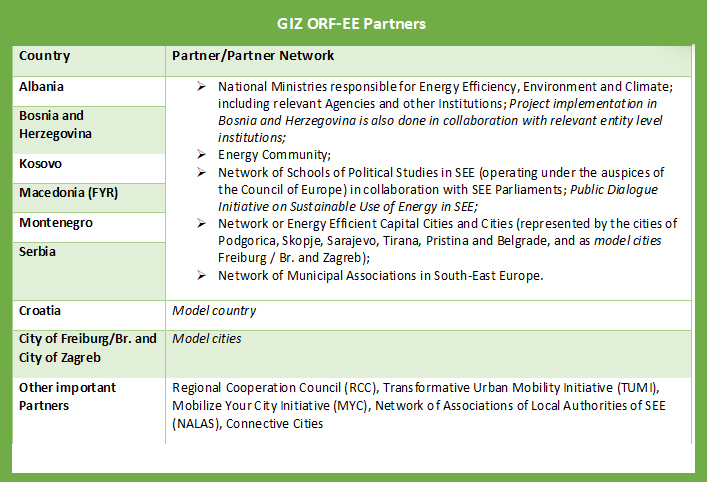 ORF-EE supported the establishment of the Network of Energy-Efficient Capital Cities in South-East Europe, comprised of the cities of Zagreb, Sarajevo, Podgorica, Skopje and Tirana. German city of Freiburg im Breisgau acts as the model city within the network. ORF-EE supported partner cities in joining the European Covenant of Mayors Initiative, undertaking to reduce their CO2 emissions by at least 20%, by 2020. The Fund helped establish energy management structures, EE info centers and supported the development of the Sustainable Energy Action Plans. Through the Public Dialogue Initiative on Sustainable Use of Energy in SEE, the Network of Schools of Political Studies in SEE is contributing to strengthening the political will for sector reforms in the region. Efforts are directed at participatory policy making processes by inclusion of various stakeholders, such as members of parliaments, civil society, business/private sector, media and governments. 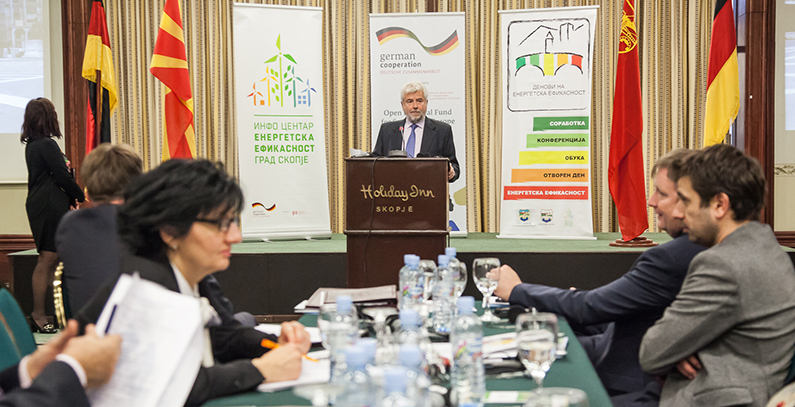 As a result of these efforts, public hearings of parliamentary committees responsible for energy efficiency were held for the first time in SEE partner countries. Through these hearings, the processes of development and implementation of legal frameworks in the energy efficiency sector has been accelerated. GIZ ORF-EE advised national ministries of SEE countries on developing and monitoring National Energy Efficiency Action Plans, which are mandatory across the EU. To enable the designing of governmental energy efficiency instruments, which allow for a more precise assessment of impacts of national direct energy-savings and effectiveness, ORF-EE, in collaboration with partners, developed a monitoring system. It was complemented by a software program – the Monitoring and Verification Platform (MVP) for calculating energy savings and CO2 reductions, achieved through implemented energy efficiency measures. The system has been transferred to relevant national institutions for use. The Monitoring and Verification System (MVP) was enhanced through the ORF-EE multEE project, implemented under the EU Horizon 2020 program, proving itself in practice as a smart and innovative solution applicable to SEE, but also finding use in the EU. It was implemented in several EU countries. Support was also provided through transfer of experiences and best practices, using the cross-border peer-to-peer approach, from individual municipal associations to other associations in the region. As a result, the support provided helped strengthen capacities of municipal associations in providing efficient services in the field of energy efficiency to their members – the municipalities. Municipalities were enabled to more effectively offer energy services to their citizens. 18 pilot projects have been developed and implemented in 18 municipalities across SEE. As a result of the Public Dialogue Initiative on Sustainable Use of Energy in SEE, implemented under the ORF-EE, collaboration between the members of SEE parliaments and the Energy Community was established for the first time. It led to the creation of the official EnC body – the Parliamentary Plenum, represented by members of parliaments of contracting parties. Through implementation of various activities and events, including the international Energy.Development.Democracy Conference and Energy Days, a platform for exchange of know-how and experiences was created. Furthermore, collaboration possibilities between SEE countries and energy sector relevant regional, and international actors were secured. 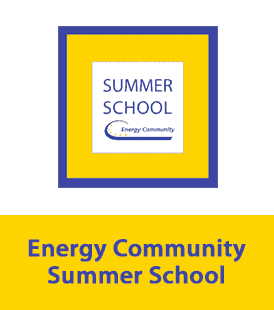 Subject relevant capacity building of 80 young Energy Community Summer School participants has been successfully conducted, since 2016. Acknowledging positive experiences of the ORF-EE in working with the NGO sector in SEE, the EnC Council of Ministers decided to intensify its cooperation with NGOs. This contributes to promoting more transparent and participative decision-making in the region. Continuous support and awareness raising of relevant stakeholders, partners and the general public on energy efficiency and climate change, and more recently on sustainable urban mobility, is continuously provided by ORF-EE.